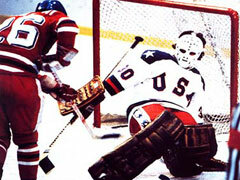 The United States stunned the hockey world by winning gold in what was dubbed the "Miracle on Ice." These games also witnessed Canada's first appearance since 1968. Professionals were still not allowed to compete at the Olympics which meant that Canada and the U.S. once again had to rely on amateur national teams. The Olympics represented this year's pre-eminent tournament since no World or European Championships took place. Stocked with inexperienced collegiate players, Team USA began the Olympic tournament with a 2-2 tie against Sweden on defenseman Bill Baker's goal with 27 seconds remaining. Jim Craig starred in net, as he would throughout the tournament. The Americans then startled Czechoslovakia 7-3 and followed up with victories over Norway, Romania and West Germany. Canada competed well in the preliminary round but losses to Finland and the USSR kept them from advancing. They finished sixth after a disheartening 6-1 loss to Czechoslovakia. The U.S.A. and Sweden finished the round robin with 4-0-1 records, but the latter earned the number one ranking as a result of a superior goal differential. 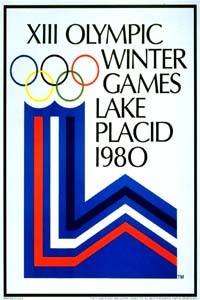 Consequently the Americans faced the powerful Soviet Union in the first game of the Medal Round. Mike Eruzione's third-period goal against Vladimir Myshkin proved to be the winner in a shocking 4-3 U.S. victory over their heavily-favored Soviets. With a crowd of 10,000 jammed into the Olympic Arena and millions more Americans glued to their TV sets, the USSR built up leads of 1-0 and 2-1 during the first period, but a Mark Johnson goal as time expired sent the teams to the dressing room tied 2-2. Soviet coach Victor Tikhonov then replaced legendary goaltender Vladislav Tretiak with Myshkin to start the second period. After 40 minutes, the Soviets led 3-2 and were out shooting the Americans 30-10. In the third period, Johnson tied the game before Eruzione immortalized himself with the most famous goal in U.S. hockey history. The Americans faced Finland in the final game two days later. A loss would have meant a silver medal, but the United States earned gold with a 4-2 victory. The USSR took their frustration out on Sweden by a 9-2 score to capture the silver and leave their opponents with the bronze.